Welcome to the java j2ee online tutorial site. This site gives a good collection of articles, tutorials , interview questions and pdf guides from basics of java to high level of Java EE or J2EE. 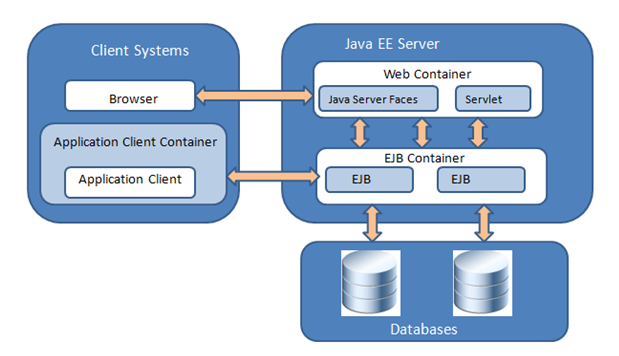 Java Enterprise Edition is a standard for developing applications based on enterprise softwares. Java Platform, Enterprise Edition or Java EE is an enterprise computing platform on Java from Oracle. Nowadays Java EE comes up with rich enterprise software platform and provides lot of implementations.There is lot of JSR (Java Specification Requests) that’s been submitted. This site has different sections that will help aspirants in the Java enterprise world. The above diagram shows a sample request response flow in a Java EE world. For anyone new to Java or J2EE world , the below sections will be of great help. The UI( User Interface) section focuses on the development of front end part of enterprise applcations. The main front end frameworks that we are discussing are listed. Server side related framework tutorials help you to understand the server side components in the Enterprise platform. The server side components are mentioned below. Service Oriented Architecture (SOA) and NextGen technologies are listed below. You can also refer the Interview questions and certification sections in the site for your interview and certification needs. You can also visit official website and support forums for getting more details.